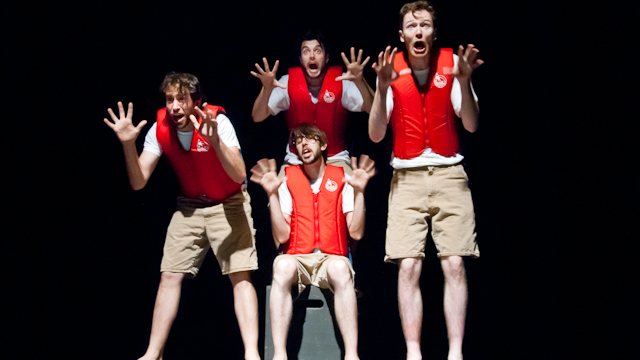 One of Canada’s greatest sketch comedy troupes, Uncalled For’s mindblowingly inventive Fringe/Next Stage Festival tour through the semi-unconscious dream state- Hypnogogic Logic– made for one of the most memorable theatrical experiences possibly ever. The 8-piece group, nominated for a Best Fringe Performance My Theatre Award and scattered across the continent, joined forces to produce one big multi-location interview for our Nominee Series. How did Uncalled For first come together? Had any of you worked together before? We all met in college. But like, Quebec-style college, CEGEP, which is just like bonus high school. Matt [Goldberg] met everyone doing various other projects, and pushed everyone to start an improv troupe. And then even though he’d invited everyone, he still made us all each audition? He’s a good friend that way. How’d you land on the name “Uncalled For”? We fought for years. Literally. Then Mike [Hughes] suggested it out of nowhere. He’d actually suggested it years earlier, but we forgot. Like all things Mike comes up with, it took a while to catch up to his genius. Who are some of your comedy heroes? The Pajama Men (back when they were Sabotage, especially) were a big influence. We also love The Cody Rivers guys waaaay too much. Python and Stella are also amazing troupes, but people we’ve never had beers with. What’s the best bad joke you’ve ever told? It’s probably something about Pi. Yeah. We’re THOSE guys. We also had a scene about the invention of sliced bread that ended… Well… Predictably. How do you approach creating a new work? With great excitement, and crazy amounts of obsession. We really value structure in our ideas. We will come up with a general theme or concept, and try to riff off that. But when we start writing, that initial idea ALWAYS changes. We are inspired to move in new places… And, well…. To move away completely from that first idea too. So our shows end playing around an idea, but can sometimes explore some pretty weird side-roads. Tell us about Hypnogogic Logic– what’s the method to its madness? We wanted to explore the vivid dream logic that we have in the moments just before we drift off to sleep. The show is all about those super-quick connections we make. We more or less follow a single dreamer through this weird twisty road… And I think it’s safe to say there’s a bit of each of us in this dreamer — which is why we all become interchangeable by the end. What were some of the sketches that got cut from the show? Were any added at the last minute? So many! The show has lived in 30, 45, 60 and 75 minute versions. The full 75 has only ever played in Toronto, and contains a bunch of stuff that came much later — like the scene about reality prank television, and the bit about Monsters. There also used to be a whole weird , amazing long mime bit with babies, boats, and remote control helicopters. You performed the whole show in life vests- why? It was the safest choice. Do you design each show for a specific set of performers or do you rotate through your roster? The shows are meant to be flexible. We always want all of us in every show, but that’s unrealistic. This show works best with a base cast of 4, though we’re working on a 3-man version. It’s tough — we really want to be free to tour it, but it is hard to get every member together for every show. Every movement in the dance at the end appears earlier in the show. Some are repeated several times. I think that’s my favourite part. Obsessive details! I also love the final wake-up. What are you doing now? Plug your upcoming project(s). Uncalled For Presents: Ready, Set Götterdämmerung [premiered] at Toronto Sketch Fest, but we are going to workshop it a bunch more and hopefully re-premier it in the coming months with a full run! Stay tuned!